Administrator’s note: After Team SF submitted its proposal to the FGG board and assembly, it received in rapid succession two email inquiries from an FGG board member. As it is not clear whether that individual was writing on his own behalf or for an organization, we di not reprint his email here. The Team SF response is public and so is reproduced. 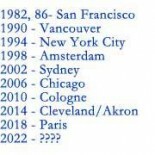 ❏ You requested on 18 April 2015 clarification about the evolution of the Team SF Resolution for the Continuation of the Gay Games that would curtail the rivalry with the World OutGames (WOGs), and you were told by Gene in a response from the TeamSF board that there would be a formal response forthcoming shortly. You then sent us a second email the same day with many assertions and more questions. As you have addressed the questions to Gene as the spokesperson in the first post, we of TeamSF will continue to let Gene respond in the same way with our sanctioning to post the official TeamSF response. ❏ You asked if the fact that Gene was the spokesperson meant that he was the delegate to the FGG. Gene has been one of the delegates for Team San Francisco since the 2010 General Assembly meeting. Currently the other delegate has been Valerie Mulhollen. Gene is corresponding for the TeamSF board because he has the time right now to disseminate information and get approvals from the TeamSF board in a timely manner. ❏ Valerie as TeamSF female delegate and Roger as an HLM both can post their own personal comments to the General Assembly discussion directly. Martha can also post as FGG Board member and TeamSF Board member as well. Gene must differentiate his personal comments from the official TeamSF posts, and he has already been using the ‘IMHO’ (in my humble opinion tag). These statements here have all been approved by the TeamSF board today. ❏ You are incorrect when you say we are confused about the role of the One World Event (1WE) Working Group (WG). Our proposal was specifically not sent to the WG, because the WG does not answer to TeamSF, we are not a part of it, and we are not in control of its discussions. TeamSF did what it was asked by the WG as a full FGG General Assembly member: to distribute the Cologne Report information as confidentially as we could without publishing it in the local papers, have a Town Hall, and arrange a meeting with Sara Lewinstein for the WG reps. The TeamSF proposal was then sent to the FGG Board and the General Assembly. This is because we are part of the General Assembly and are very concerned with the Gay Games Mission and its furtherance. ❏ The survey, as was repeatedly pointed out to us, was not solely of Gay Games stakeholders, but a much broader, differently defined constituency. The survey did not ask about the Gay Games, it did not ask about a global quadrennial LGBT sports/cultural festival, and it did not ask about what emphasis should be placed on inclusivity and diversity in sports participation as a human rights mission/strategy. So there should not be much surprise that the recommendations of a group such as TeamSF, committed to the mission and principles of the Gay Games, might have different options in mind after reading the Cologne Report. Decisions down the road on what the Gay Games do will be made by the FGG board and General Assembly tasked with advancing the Gay Games Mission. We thought we made that clear in our proposal when we quoted the mission from the FGG bylaws, which were not understandably not referenced in the WG report or the survey; we apologize if that was insufficiently explicit. ❏ We are confused, however, by your question of whether we received sufficient direction from our TeamSF membership, but that somehow we might have been out of line in sharing within the FGG, of which we are a member, our thoughts. This parallels the confusion which resulted from the initial notice we received from the WG which asked us to somehow share the Cologne Report with our membership and yet not distribute it publicly. It is difficult to discuss something privately in public. ❏ TeamSF -has- been requested by the FGG repeatedly, as have other General Assembly members, to become more involved, to share thoughts and observations, as active members. We believe we are all aware of the difficulties of communicating complex issues, concerns, and information with memberships. Would it have been better if there were no discussion and identification amongst the FGG membership until the days of voting and its inevitable compressed time constraints? Regardless, we enthusiastically thank the WG for giving TeamSF a forum to discuss 1WE, something that was lacking in 1QE. ❏ As a point of clarification, we were specifically asked by an FGG board member to get our TeamSF proposal in front of the General Assembly for discussion, and we had several individual requests from FGG General Assembly members to see it. The implication that we are doing something out-of-line or lacking in protocol is an insult. We further disagree with the assertion that the FGG board dictates to its membership as your email stated. The TeamSF board is also the legal and functioning external surrogate for its membership. It does not dictate. It works best when the membership is engaged and fully informed and the board is fully informed of its discussions. This was the point of the Town Hall questions about the FGG and TeamSF California 501c3 by-laws … TeamSF preceded the FGG, and some of the same lawyers cast the same language in both documents. TeamSF is very well aware of the legalities of how membership organizations should work under California 501c3 law. 1.) The content of this email and its attachments are not for public dissemination or distribution at this time. Our Boards have signed a Confidentiality Agreement, so please continue to respect that Agreement at this time. 2.) The 1WE Working Group is drafting Talking Points which we will share with everyone in the coming days. …nb: The TeamSF board never received talking points from the WG on the preferred WG recommendation, so we did the best we could with it. 4.) FGG Assembly members are allowed to share these documents with their governing bodies, who in turn can share it with their local organizations and/or their individual members. That sent a conflicting message: share with your public but don’t share publicly. We did not ignore your request; we fulfilled it to the best of our abilities. As you noted, the discussion that resulted in the Town Hall Meeting (room rental out of our own pockets) was robust. Perhaps it would have been clearer to send a link for read-only access that could be distributed? In any event, we regret we did not understand how to resolve the conflict between private and public distribution to your expectations. The files were made available on specific request from the web site, and we did send them to specific people we knew and trusted who asked to see them. Most people were content/satisfied to trust the TeamSF board to summarize them once they learned of the length of the WG documents. ❏ “Reunification” is a word which throws us for a loop. Perhaps you meant “Unification”? Reunification implies a divorce of parties that were once joined. In reality, the “marriage” of the 2006 organizers who created the World OutGames were never legally joined with the FGG. We sincerely believe, for all of the reasons stated in our proposal, that the TeamSF proposal offers a more realistic model for a unified LGBT sports world than the Cologne report recommendation. ❏ We, too, were delighted to have former FGG Treasurer HLM Alan Lessick at the meeting — one of the many local supporters who came out as a result of our distribution of the points of the WG recommendation and the Team SF proposal. We note he really did not speak so much on the Team SF proposal as he did on the interactions of GLISA and the FGG. His skepticism that they could or would ever function together as one unit was not news, but was accurate. We agree with Alan’s concerns and think the TeamSF proposal best addresses them by keeping the two organizations separate on their different missions and different events. ❏ You are probably correct when you assert that the emergence of stronger single-sport organizations and stronger local single-sport clubs has made them for many Gay Games participants a stronger force than their city teams. We regret, however, that you feel that city team members of the FGG General Assembly have become “extraneous layer(s) of administration that very few need, or want.” Not all Gay Games constituents are in large sports with 501c3/NGO status that can manage major fundraising campaigns, or have sufficient private funds to pay for their attendance at the Gay Games. We do what we can with our own Team SF scholarship fund to send participants to the Gay Games. We seek ways to help member clubs help each other. We do what we can to support the Gay Games, however slight our role may be. If you truly believe the city teams are extraneous, perhaps you should introduce a bylaw amendment to drop all city teams from the FGG General Assembly. We, however, would not support such a position. ❏ You are incorrect in stating that the two women present were Team SF board members. One of them was not; she was representing the local LGBT sailing team. ❏ You are correct in your notation about the lack of minorities, younger athletes, and women. In addition, we do not believe there were any transgender individuals there. That is a further illustration of why TeamSF urged in its proposal that the FGG concentrate more on ways to make the Gay Games affordable, accessible, and properly marketed to those demographic groups rather than on how to create a new event/entity/brand less focused on sports. ❏ The TeamSF proposal intentionally does not address governance of a new event and a new organization because it does not create a new event or a new organization. It supports the existing events and urges the existing organizations to do them better. ❏ You requested in the first email clarification about the evolution of the Team SF Resolution for the Continuation of the Gay Games that would curtail the rivalry with the World OutGames. The very first Team SF resolution regarding the World OutGames, which contained the call for the continuation of the Gay Games intact, and sports human rights conferences to be an external component, was written in 2009 after World OutGames 2 Copenhagen. TeamSF teams and individuals who supported Copenhagen returned with concerns about the sports fueled the discussion about also issuing a TeamSF press release to no longer support World OutGames (WOGs). The link to it is contained in our new proposal sent out on 17 April 2015 and is repeated here. Our stance was reaffirmed in 2010 when the topic was coming up again at the FGG General Assembly meeting. When the 1WE WG committee report was issued 28 February 2015, we took up the topic again in TeamSF board discussions; the process is described in our proposal. The board proposed a few new elements to update the former proposal. We brought in the goal of making the Gay Games more affordable in these challenging economic times and more accessible to people with little ability to spend more than a week at the event. The 2009 proposal did not specifically mention the Gay & Lesbian International Sports Association (GLISA); the implication was that they or any other suitable group could possibly organize a sports human rights conference externally. In the TeamSF board discussions this year, we proposed explicitly first inviting GLISA to stage the conference component, and we removed the “sports” requirement for the conferences. Although we think conferences that address sports would be most valuable and suitable for a Gay Games affiliated event, we know we are not conference experts and do not know what kind of scope would work best for putting together a conference program. We had not mentioned in 2009 Sin City Shootout nor Paris TIPS as examples of the kind of continental events we recommended the FGG encourage; we now added them as more of our members would be familiar with them than Continental OutGames or EuroGames, mentioned in both the 2009 resolution and our new proposal. Those points of revision were circulated among our members through our best communications means possible. We are a geographically fairly small area and all of our board members are very active in their sports, some in more than one sport, so we are fortunate to have good communications on a daily or weekly basis. The TeamSF board recommendations as well as the 1WE WG report recommendation were circulated on our social media. A column in the Bay Area Reporter on the two proposals was also posted and reposted on the social media of numerous members. That drew heavy interest and very positive comments regarding the TeamSF board recommendations. Following the comments made online and at the Town Hall Meeting on 11 April 2015, the board revised and drafted its proposal and unanimously (with one recusal) approved the resolution we sent. The clarifications we put in the proposal spell out the goals of the proposal — e.g., the idea of reducing the length of the event and cutting back on opening and closing ceremonies is so that people with less free time and money can attend and assist in the goal of bringing in more women, younger participants, and minorities. Also, we spelled out our desire for the FGG to redouble its efforts to come closer to gender parity. So, to answer your question, as has been the case throughout our history, the TeamSF board held its talks, requested discussion from membership which was received online and in person, and then the board drafted and voted on the proposal posted. And, as always, we will continue to listen to our membership going forward. ❏ Your inquiry also referenced the attendance at the Town Hall Meeting as being “at least two dozen.” There were considerably more than that. The main audience was seated in seven rows of six chairs each. There were more chairs to the side for some our TeamSF board members and speakers, and some stood. The room was pretty full the entire three hours and some people came in late or left early. So, approximately 40-42 people, or 3.5 dozen. The Town Hall reflected the leadership of the various TeamSF individual and team memberships who have a vested interest in Gay Games. We counted people at the meeting, took names, and it was ~40 over the 2 hour period. We have an old listserv of ~700 that we are only permitted to use for Gay Games/Host activities during the quadrennial per the terms & conditions of GGs registration. But it would have been a violation to use that listserv to publish the Cologne Report or the TeamSF Proposal. For announcements of ad hoc meetings and events like the LGBT night at the SF Giants, we use social media and news media. ❏ On a side note, we thought we would share an anecdote the FGG General Assembly might feel heartened by. As FGG Co-President Kurt Dahl was waiting for the Town Hall Meeting to begin, he noticed a virtual army of parents pulling up and getting out with their young children to make their way into the recreation center. After a while, he told us, he realized they were moms and dads bringing in their children to be coached by an openly gay African-American coach provided by Team SF’s own Golden Gate Wrestling Club through a program GGWC runs for the city. That is just one example of how sports participation and the self esteem and confidence they empower us with pay dividends in healthier community relations and better social acceptance. As so many of the folks who spoke at the meeting told us, it is that ability to express themselves through SPORTS that they discovered or rediscovered at the Gay Games that makes them so loyal to the brand and movement.